BIGDATAPUMP awarded Microsoft Gold Data Analytics competency! 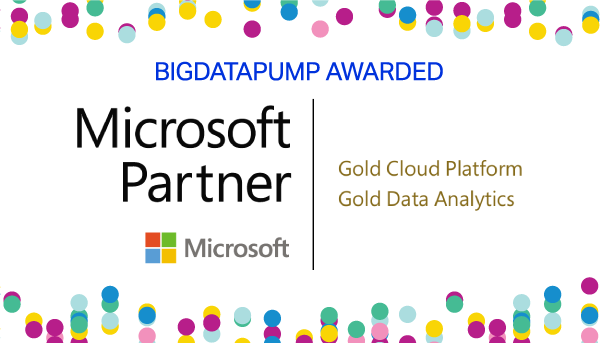 I'm delighted to announce that, as an active member of Microsoft Partner Network, BIGDATAPUMP has attained the Gold Data Analytics competency. This comes as an additional achievement to the Gold Cloud Platform competency our company previously attained in May. The competencies awarded nail pretty much perfectly what BIGDATAPUMP does. We do Data Analytics and we do it on Cloud. The Data Analytics competency is for Microsoft Partners experts in delivering, deploying and supporting Microsoft Business Intelligence and Data Analytics solutions. As a Gold Partner, BIGDATAPUMP is continuously delivering IoT and Data Platform solutions to customers seeking to differentiate their business. BIGDATAPUMP is the leading analytics company in Europe developing next generation data and analytics solutions for our customers in multiple business branches. As a trusted partner in digital transformation, BIGDATAPUMP provides consultation, technology solutions and implementation services, which enable our customers to enhance business performance through better decisions. To learn more about Microsoft, Azure Cloud or BIGDATAPUMP's Gold Data Analytics competency, please do not hesitate to contact me.